Via WEBCAST: View on your device at a place and time convenient to you (expected to be ready to view by mid-to-late November). 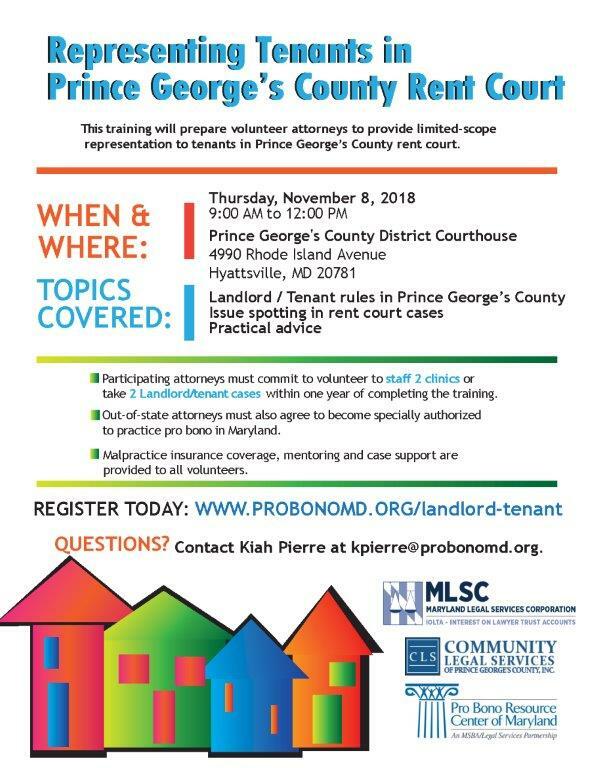 The training, co-sponsored by Community Legal Services of Prince George’s County (CLS), will cover Landlord-Tenant rules, cases, and practical advice, preparing attorneys to represent tenants in Failure to Pay Rent cases. Attendees must agree to fulfill two (2) units of volunteering within one year of training. One “unit of volunteering” is EITHER participating at one (1) CLS Rent Court Clinic OR taking one (1) landlord-tenant case from CLS.